Use a high quality ethylene-glycol coolant in a 50/50 mix with water. The engine coolant should be compatible with aluminum engine parts. Additional corrosion inhibitors or additives should not be used. The cooling system must be maintained with the correct concentration and type of engine coolant to prevent freezing and corrosion. Never allow the concentration of antifreeze to exceed the 60% level or go below the 35% level or damage to the coolant system may result. 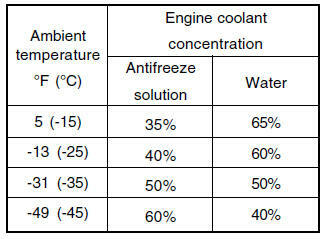 For proper concentration when adding or replacing the coolant, refer to the following table.